Toronto is an exciting place during the winter and with these 8 cheap and free things to do you’ll definitely be in the mood to go out and enjoy all the not-to-be-missed experiences. If you’re tightening your budget after all the holiday spending, don’t worry. There are plenty of free and cheap things to do in Toronto in the winter. From DJ skate nights to light festivals, there’s a long list of activities and events happening all over the city — we’re sure you’ll find something unique to do to lift your spirits and shake off the winter blues. The annual Toronto Light Festival lights up the long gloomy nights of winter from January 28 to March 3, 2019. 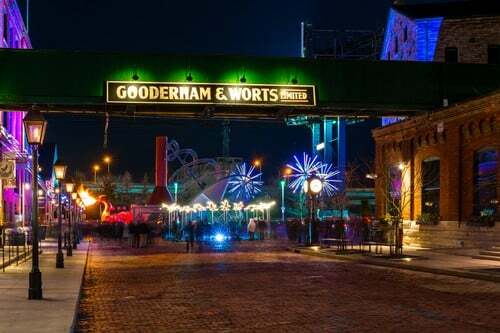 This free event takes place again this year in the Historic Distillery District with local and international artists putting on a magical display of illuminated artworks and large-scale installations that will surely be a sight to behold. Another winter favourite, Icefest is a cultural event held every year to celebrate the winter season. Now in its 14th year, the event showcases tons of ice-related festivities for the entire family to enjoy — incredible ice sculptures, live ice carving demonstrations, ice exhibitions, photo booths, live DJ’s, scavenger hunts, warm food and hot beverages! All activities take place in the heart of the city at Bloor-Yorkville from February 9th to February 10th and admission is free for all ages. Icefest is also a charitable as it continues to raise funds for the Heart and Stroke Foundation in support of Heart Month in February. Everyone’s sure to have so much fun and its all for a good cause! Ice skating is a favourite winter activity, and if you’re one of those who loves to ice skate the figure-eight shaped Bentway Skate Trail located under the Gardiner Expressway is definitely a must-visit. The Bentway is open for the winter season until Feb. 18, 2019, and admission is free for all ages. If you don’t have skates, you can take advantage of the free skate rentals on Thursday nights from 5pm to 9pm. 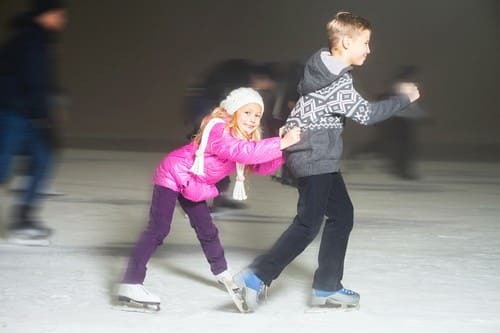 If you don’t know how to skate and are dying to learn, then make sure you check out the free drop-in skating lessons from 6pm to 8pm every Thursday until February 14. There’s also an event presented by Kahlúa for adults 19+, Après Skate Saturdays, where you can meet up with other skaters and enjoy complimentary samples with coffee or hot chocolate from 5pm – 9pm. If you don’t want to skate, you can take advantage of the snuggly blankets, warming lounges and fire pits all around the place and just warm up from the cold for a few hours. That’s lots of free stuff at the Bentway, don’t you think?! If you’re in the mood for an outdoor party – the kind with really loud music and a crowd of people, then lace up your skates and get into the groove at Natrel Rink, Harbourfront Centre for DJ Skate Nights every Saturday from 8pm to 11pm until February 20. A stellar lineup of local and international DJs play lively beats of disco, hip-hop and techno so you can dance and skate the night away and beat the winter blues. The best thing of all, this nighttime winter party on ice is totally free! Reading is a relaxing pastime for many of us and if you’re in the mood to snuggle in a warm, cozy spot with a good book, you can enjoy a few bestsellers at a Toronto Public Library near you. 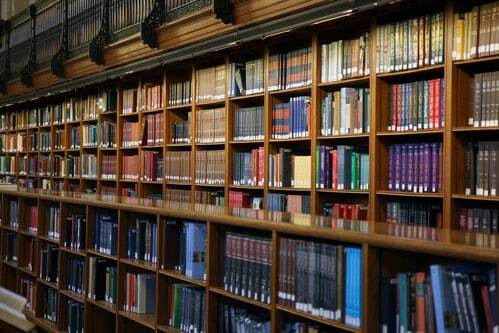 But that’s not all that you can do in your local library! You can borrow the latest books and DVD’s, yes, plus you also have access to a variety of newspapers and magazines from different countries all across the world, so you don’t have to pay for a subscription just to keep up with current events. Then there are free classes you can attend to help you hone some skills, you can learn crafts and hobbies, workshops and livelihood projects and skills to help you look for a job and ace a job interview. There are also seminars where you can get the latest information on web design, web technology, health and employment. They also hold free concerts and exhibitions from time to time so make sure to check back regularly. What’s more, you also get free passes to museums, music, theatre, film and art events all year round with your Toronto Public Library card. So take advantage of these free resources and services! Waterfall viewing is a winter must do in Toronto because these cascading beauties are transformed into a frozen landscape of intricate ice formations in the winter. There are hundreds of waterfalls scattered within Toronto and the surrounding area and most locations offer free parking and are only a short walk to the viewing platform. Just pack a picnic lunch so you save up on take out. Whether the flow is completely frozen or just a gentle trickle surrounded by snow and ice, there’s just an added dimension of beauty to these wonders that you can’t miss out on. 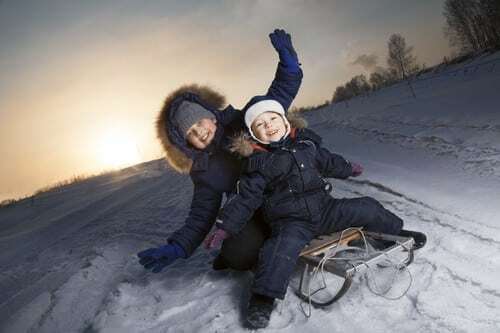 Tobogganing is one of the most fun free things to do all winter season. Just grab your toboggan or sled and head to a snowy hill near your neighbourhood and start sliding down the snow-covered slopes. Squeal with delight all you can and just have fun in the snow! The Winterfolk Music Festival is back for another year taking over Broadview and Danforth from February 22 to 24. You can listen to blues, folk and urban roots music from over 150 artists set on five different venues. There are both free and paid events, but you can get tickets for some of the paid events at just $10 if you buy in advance. A great bargain is the three-day weekend pass which cost only $15 and you can watch all the stages lined up except for the five ticketed shows. So, don’t miss out on enjoying some great music to sing away the winter blues. There’are tons of amazing free and cheap things to do in Toronto in the winter. So, explore your city every chance you get this season because you surely won’t need to stay in to save with these activities that won’t break the bank!